When I started my first business many years ago – way before Antavo – I built websites and webshops, and worked long hours designing them. I will never forget the experience that I gained at that time. Crafting all of those individual webshop experiences made me realize how important it is to show customers, that by interacting with online websites or sites they are engaging with real human beings, and not nameless, faceless strangers. There were humans behind those screens that knew what their customers were looking for, and would work hard to make their customers happy. 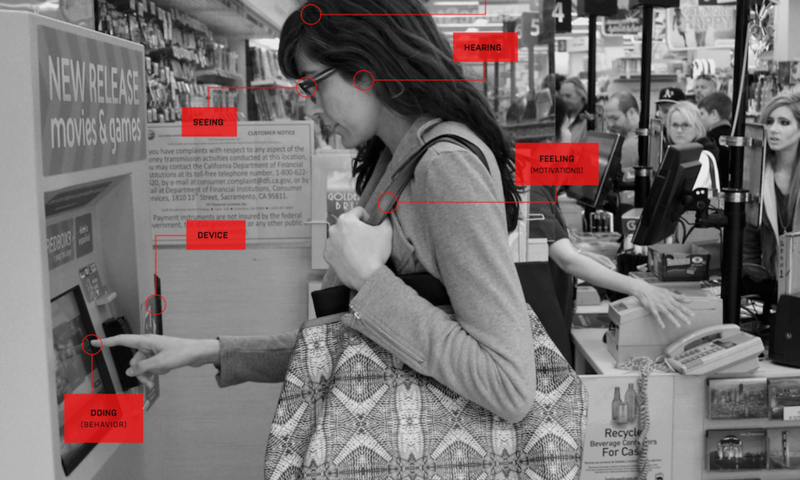 How is emotional design related to loyalty programs? We need a real change in mindset to understand the importance of a genuine smile and to find the right virtual tool to connect with people in a similar way online. However good the smoothie is, you won’t go back to a mediocre or grumpy shop atmosphere that ruins your day. Yep, that smile and customer care is what can turn your customer into a Loyal customer, which goes beyond the power of any product or brand, and this is what emotional design is all about. I am not saying that a great smile can be entirely substituted virtually, but it’s proven that utilizing a well-built loyalty program is a good way for webshops to communicate in a more natural and sincere way. It becomes the “human touch” and personality that is missing from the rather conversion-driven universe of online retail stores. And that’s where emotional design plays an essential role. The point of the emotional design is to fully understand the perspective of your user/customer and create everything with that empathy in mind. As the term implies, emotional design is also about feelings – but not necessarily in the marketing sense. The aim is not to disguise a message in provocative forms that generate laughter or tears. Rather, your mission is to connect with your audience, answer their problems, react to their needs and make them feel good. In short, relate to them and empathize. 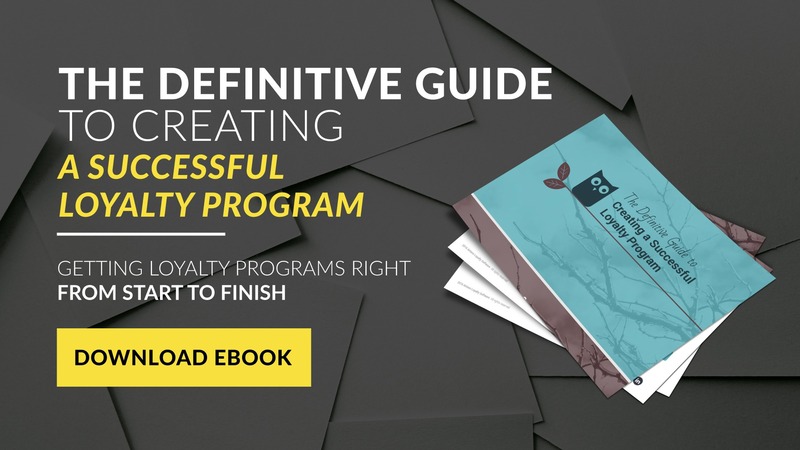 Here are some things to consider when building a program with progressive loyalty rewards that will promote a better connection with customers. Consider it as a basic checklist, or a starting point for understanding the empathetic mindset. Based on these interviews you will be able to define the real mission of your loyalty program, enabling you to connect with your customers and score that extra smile when they come across your brand name. Source: Service Design MZ. User experience research explained easily. Introducing your loyalty program can become a great conversation starter. It lets you substitute adding a pop-up to your website, which may be an easy way to introduce all the info you want to communicate, but is also mostly ignored if it appears too early. Pop-ups can be opened up from a small widget on your product site and an informative note on the checkout page thus raising engagement rates. The other factor is to use a tone of voice and language that addresses your customers directly and represents your brand at the same time. Really try to NOT be cheesy here. Typical marketing buzzwords or jargon just don’t work. If your customers are mostly millennials, they’re likely indifferent to the big promises of marketing. Try to communicate less, but with more credibility. 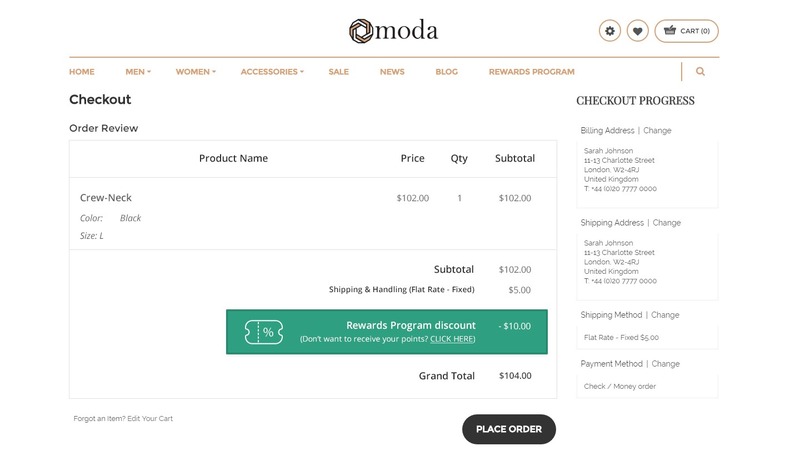 Here is an example of how a fully-integrated loyalty program can be presented on your checkout page. You can see here how a discount that a loyalty member received, can be communicated. Consider how your customer goes through the overall shopping and buying process in your webshop, from the very first step until the last action they take to complete check-out. If you recognize the potential pain points in their journey, you will also see where actions need to be encouraged with loyalty rewards. On one hand, actions that take a lot of effort from your customer can be gently prefaced with the promise of a reward and followed up with gratitude and appreciation. For example, reward your shoppers for providing some personal info and give extra loyalty points after completed purchases as well. As stated earlier, the loyalty program should be fully integrated into the user flow. Sometimes it’s hard to embed your message fully in the interface in a way that really converts, but make your best effort to reduce implementing a random flood of pop-ups. Try to experiment and calculate when people really welcome unexpected information about an opportunity. This always depends on your audience – in some cases you can come up with a loyalty program offer while they are browsing, but there is a higher chance that they will welcome your pop-up more when they’re not in active search of a product, and have already found it. There are some already well-built loyalty softwares, such as Antavo, that enable you to integrate your rewards program smoothly. When the customer makes his first purchase, that’s when we can start talking about loyalty. In customer life-cycle marketing you can build up processes like automated email campaigns to nurture your shoppers to true loyalty. 4. What’s the story behind your products? Webshops or marketplaces, like Etsy, have quite an advantage, as there’s a story and a visible person behind each product displayed. But how can you create this story when you’re not the kind of store that lists hundreds of handcrafted products and the artists who made them? There’s one option that you’re already familiar with, because it’s the basic statement everywhere: communicate your brand story and make an attempt to create a lovable brand. We know that’s easy enough to say, but that there is much to read about the journey towards reaching that point. And this still doesn’t solve the product-by-product ‘mystery.’ You can either put enormous energy into making up a story for each product, OR you can engage your customers to create stories themselves – and reward them for it. Your loyalty program provides a great platform to start a conversation and ask for people’s opinions, for example, by encouraging them to write product reviews for loyalty points. Extra tip: As Aaron Walter from Betabrand points out, display products with the help of an active Instagram community and you immediately send multiple messages: first, that there is an existing and active community behind the brand, and second, that the products are not only wearable, but also lovable. This is told through each and every story that people add via their Instagram posts. Everything I’ve mentioned so far implies that you need to create a “channel’ that has two pillars: your brand identity and a fully customer-focused loyalty environment. Ideally these work in harmony, with a smooth system for navigating between the two. Here is where the “keep it simple” rule should stay in mind, because visitors to your site are primarily there for a very specific purpose: to make a purchase. Aim for a user experience that not only relies on the element of surprise when your customer stumbles upon certain loyalty program pop-ups and rewards, but also makes the purpose of the program clear and accessible as well. Accessibility in all senses gives the impression that you are reliable and transparent. Randomness and predictability need to be in balance, as the former gamifies the experience (check out the book “Hooked” by Nir Eyal for more inspiration), whereas the latter builds trust. 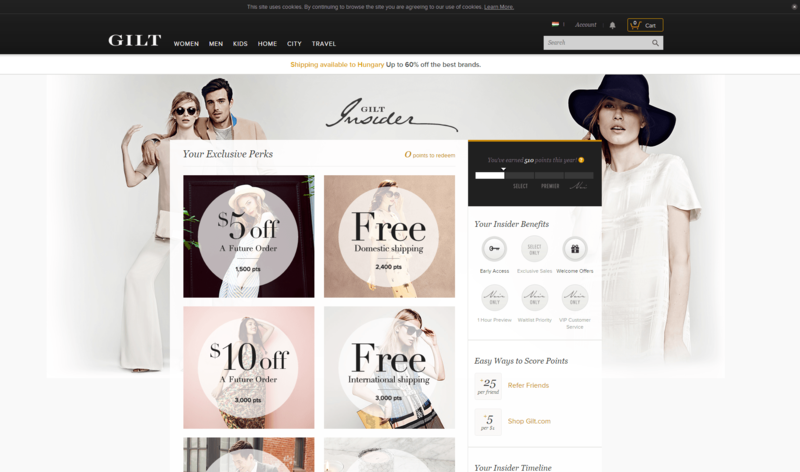 Gilt provides a perfect example for how you can create a well-designed and SIMPLE loyalty program. They use images, icons, and just a few bits of text to communicate how one can earn points and redeem them for rewards. The point of a progressive loyalty reward system is to connect to people, making personalizatin a lot more easier. To encourage your customers to stick around, ideally you would create a rewards system that is progressive and handles users differently based on their habits. Creating a leveling system has several aspects that enables you to personalize the user experience. It gamifies the user journey and encourages the competitive type of newbies to level up. On the other hand, it can help you design progressive loyalty rewards that operate differently for a first-time visitor than for a regular customer, or a brand advocate who you want to keep close to your brand for as long as possible. Ideally, the best would be to build a retention strategy by researching different types of personas and combining a system of levels with different action types and rewards. Creating a tier system with a retention strategy in mind considers the different habits of different users and personalizes the entire shopping experience that explicitly appreciates returning customers. 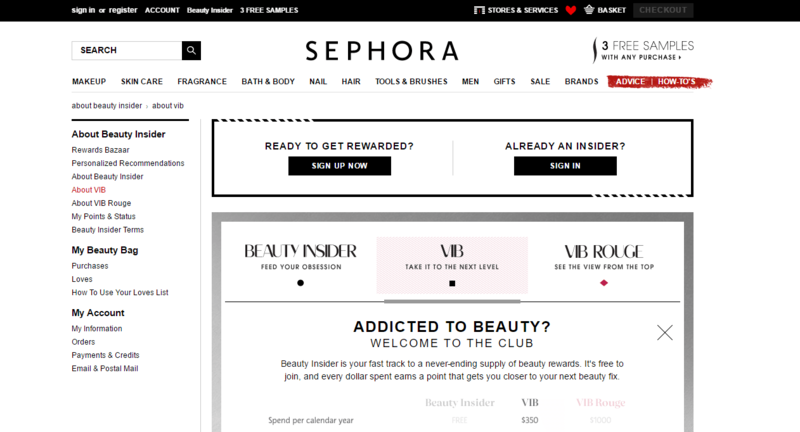 Sephora’s level system is straightforward and easy to understand. Not to mention that the levels’ names resonate well with their target audience’s personalities. Emotional design and progressive loyalty rewards in loyalty programs help you identify those who are willing to enjoy your products. Of course, a well-designed loyalty program cannot miraculously transform a low quality product it can significantly raise the bar when experiencing a good one. As there is still an ongoing shift from offline to online shopping, there also needs to be a shift in the marketing of your business towards a practice that invites UX research and thus emotional design. Because although technology has changed the way we consume, we are still the same people who need that wink and a smile.